A lease that creates a farm business tenancy under the Agricultural Tenancies Act 1995. Suitable for terms of less than 2 years. Automatically expires at the notice period without a requirement for notice. Suitable to be used as a short term grazing lease. There is strong protection for the landlord with 50 tenant's covenants, but the tenant is treated fairly. This lease is suitable either when the landlord and tenant agree that the agreement is a farm business tenancy, or when the land and buildings being let will be farmed or used for agricultural business purposes. The term of the lease should be 2 years or less. Under the Agricultural Tenancies Act 1995, farm business tenancies of less than two years expire automatically at the end of the term, and without the need for the landlord to give notice. Agricultural business refers to using all or part of the property to grow plants (crops) or rear animals with a view to sale. The scale of the business is not important: the same tenancy laws apply whether the property is a commercial dairy farm with hundreds of acres of pasture, or 10 metres of poly-tunnel under which a prize garden plant is cultivated for sale to the public. Farming encompasses all sorts of businesses, from those growing crops in fields (including grass, hay or silage), to those where the crops are grown in an orchard or under glass (e.g. rhubarb or mushrooms), to those where the "crop" is an animal (e.g. lamb farming) or a product derived from animals (e.g. milk). Keeping animals (e.g. grazing horses on the land) in itself is not an agricultural business but horse breeding is. A garden centre is not an agricultural business, but plant growing is. Change of use may be anticipated and will not necessarily disqualify the agreement, if notice has been served. The Act does not make clear how far diversification may go. However, it has now become clear that peripheral or additional business operations will not prevent a tenancy from being a farm business tenancy, for example, operation of a farm shop or a camp site. In any case, any diversification of use other than farming is likely to require the consent of the landlord. If the use of the property is for non-agricultural business use, such as tractor repair and storage or feed merchanting, use one of our agricultural leases instead. For shorter terms using one of our agricultural land licences might more appropriate. 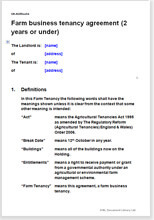 We also offer another version of this farm business tenancy agreement for when the lease period is longer. This document complies with the Agricultural Tenancies Act 1995 and the 2006 Agricultural Tenancies Order. It is the legal requirement under section 1(4) of the Agricultural Tenancies Act 1995 that landlord and tenant must acknowledge that each has received a written notice from the other to confirm that they are going to form a farm business tenancy. We have zipped the copy of this notice for your convenience with this document. This lease comes with a menu of over 50 options to empower or restrict the tenant. The terms have been carefully considered to protect the landlord's interests while remaining fair to the tenant.